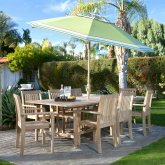 When it comes to garden and wood patio furniture, there are a myriad of choice on the market. It must be a variety that has an innate resistance to rot and decay-causing insects and organisms for wood furniture to stand up to the elements, week after week and year after year. Most woods are not suitable for outdoor furniture, however there are two main categories of woods that do hold up to the demands of the outdoor environment, they are the tropical species and the “sleepers” which are some of our own domestic woods. The “sleepers” woods have physical barriers to rot built into the pores of the wood, called tyloses. They actually fill the pores of these fine woods, blocking out moisture and decay causing organisms. They are generally not used for outdoor furniture due to their cost and because we most often utilize them for fine interior furniture. Other domestic varieties such as redwood, cypress and many cedar varieties also contain chemical compounds that repel insects, bacteria and other rotting agents.These woods include white oak, black cherry, black walnut and black locust. The tropical hardwood species, most notably associated with teak wood outdoor furniture include mahogany wood. These hardwoods have been significantly over-harvested in South America and Southeast Asia. As a result many manufacturers are now utilizing only plantation grown teak and other plantation grown hardwood such as Shorea, Eucalyptus, Acacia, Cedar, Cypress, Redwood, Balau, Kempas, and Teak. These types of tropical hardwoods are not as familiar to most of uses the gold standard teak wood but they are warp resistant, rot resistant, finely grained and very hard. Let’s look at of these woods in detail to see why they are a good choice for consumers who wish to balance quality and value. Shorea, there are approximately 196 different species in the shorea genus that are native to rainforests of India and Southeast Asia. They are some of the tallest trees in the world with a few specimens in the wild being measured at over 260 feet tall. Like teak, shorea wood has a high oil content that makes it resistant to rotting and infestations by insects. Fresh shorea wood has a lovely golden, it will weather to a silvery gray color just like teak wood if you leave shorea wood untreated. Many many people have an appreciation for this natural color transformation. However, there are various teak furniture care products would do the job if you would like to maintain the golden color of new shorea wood furniture. You may be surprised to find out just how heavy the wood is when your shorea furniture set arrives at your door. 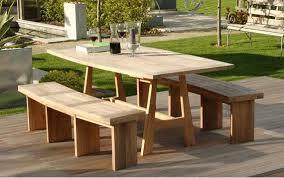 In fact, shorea has an even higher density than teak due to the tighter grain of the wood. It has a durability that will stand the test of time. No matter what climate you live in, your shorea outdoor furniture should last many decades. The main advantage shorea has over teak is its lower cost. Eucalyptus is a native of Australia where it is famously known as the only food eaten by koalas. This tree is so useful, though, that it is now grown in dozens of countries across every continent except for Antarctica. The oil produced by eucalyptus tree is a natural insecticide. It is also used extensively in a wide variety of health and beauty products. Eucalyptus is an incredibly fast growing tree. This means that it can be grown in a sustainable manner. It also makes it a valuable natural resource for farmers and villagers in developing countries. Eucalyptus trees also have a very attractive white to silvery-grey bark, which combined with their fast-growing nature makes them an excellent shade tree to plant along roadways. You should know that it is an excellent hardwood and can last up to 25 years exposed to the elements if left untreated when considering eucalyptus outdoor wood patio furniture. And with regular maintenance it can last much longer. That said, it is not quite as strong or durable as teak. Acacia trees grow in such abundance in many regions of the world, that they are often considered an invasive species. For those concerned about sustainability and eco-friendly living, acacia makes a good choice. Acacia is a dense, durable hardwood that can withstand the elements. It is often used in boat building. Sealing acacia serves to enhance and preserve the wood’s rich, golden brown color. Acacia should be reserved for deck or patio furniture, since constant contact with the damp ground of a garden may cause the wood to discolor if left unsealed. Cedar is a lightweight wood, making it the perfect choice if you plan to move or rearrange your outdoor furniture often. The resins in both western cedar and northern white cedar render these woods resistant to both insects and rot. If you would like your bench to match your house or other furnishings, cedar is also a good choice since it paints and stains well. In fact, yearly cleaning and sealing of cedar are recommended, as the soft grain becomes rough over time if left untreated. Left in a natural state, cedar weather to an elegant silvery gray over time. Bear in mind that cedar is rather soft, so it will dent and scratch more easily than harder woods like shorea or teak. Paradoxically, since cedar retains moisture, rather than drying out, it is more resistant to cracking than many other woods. Cypress is capable of withstanding the elements without a finish of any kind, though a periodic coat of oil will keep the wood looking fresh longer. Cypress wood contains a natural preservative that is both rot and insect resistant. Like cedar, cypress weathers to a silver gray over time when left unfinished. Cypress is also a very stable wood, with little shrinking or swelling throughout the changing seasons. While cypress is a good choice for outdoor furniture, it may be a little difficult to find due to the scarcity of mature trees. Redwood trees grow slowly and are in limited supply that is why redwood is not a good choice for the ecologically minded. The wood’s many fine attributes, however, ensure that redwood will always be used for outdoor furniture as long as harvestable stands of these majestic trees remain. Redwood is durable and weathers well, and is also naturally resistant to decay and insects. Among redwood’s most valued attributes are stability and a tendency not to shrink nor warp. Like cedar, redwood is relatively soft, putting it at risk for dents and scratches. The deep brow beauty of redwood can be protected and enhanced by a coat of clear sealer. Redwood can exact revenge on its owners by staining clothing with the natural tannins that give the tree its name. Balau is a dense hardwood used mainly for heavy construction, native to Indonesia, Malaysia an the Philippines. Other names are Selangan Batu Giok, Belangeran, Empenit Thitva, Alan, Shorea Glauca, Maxwelliana, Shorea Seminis, Shorea Laevis. The heartwood of balau is yellow to brown, which is distinct from the paler sapwood. It’s moderately fine and even texture present an interlocked grain which produces a stripe figure on the radial surface. Balau is also susceptible to pinhole borer damage. In relation to its density, balau is relatively easy to work. It does not contain silica, however resin pockets may be present, meaning resin can build up on cutting equipment. Pre-drilling is advisable when nailing. Balau can be painted and polished but is not suitable for steam bending. Kempas tends to be an orangish-brown, with an overall mahogany-like appearance. It has a medium to coarse open texture. The grain is interlocked and sometimes wavy. The wood can also have streaks of brittle tissue that can be source of mechanical weakness. Heartwood is rated as as moderately durable to durable regarding decay resistance. Kempas is susceptible to termite attacks. Kempas is considered to be a difficult timber to work on account of both its density and its interlocked grain. Also, sections of the wood may contain stone-like streaks of brittle areas, which can have a blunting effect on cutting edges, and make machining difficult. Kempas is slightly acidic and can be corrosive to metals. The wood accepts stains and finishes well. Kempas should be relatively inexpensive for an import tropical lumber, though not commonly available, except as flooring planks. Kempas is not a common timber among woodworkers, and tends to be imported primarily for flooring. Teak has all of attributes one could wish for in a wood used for outdoor furnishings. It resists decay, repels water, does not shrink or swell, ages well, and is incredibly strong. Teak’s secret lies in its tight grain and natural oils. Teak oil is all that is necessary to maintain the wood’s beautiful golden luster. 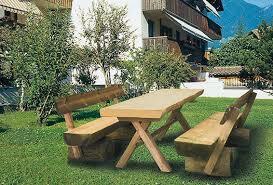 Choosing the type of wood that’s right for your outdoor furnishings is initially a question of priorities. Once you have determined the balance between longevity, sustainability, and budget, then it is time to let aesthetics take over. Because in addition to being durable, an outdoor furniture should also be beautiful. Teak wood is the answer all of them.